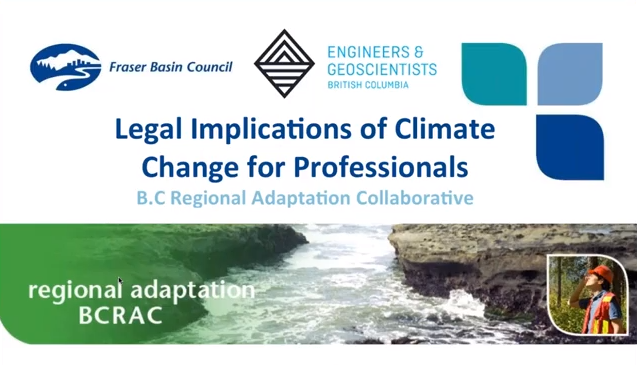 On September 28, the Fraser Basin Council held a webinar on the legal implications of climate change for professionals. In this webinar, Zizzo Strategy spoke about climate change liability issues with a focus on case law and climate-related litigation related to negligence and class action lawsuits. The webinar also touched upon recent developments in corporate governance and disclosure of climate risk, including securities disclosure and the Task Force on Climate-related Financial Disclosures. This webinar aimed to educate professionals on how climate change impacts their professional roles and responsibilities, encourage them to integrate climate change into their decision-making and empower them to make the case for climate change adaptation and mitigation. The video of the webinar is now available online. View it here.